Embracing Cottage Style: Award ceremony...clap, clap, clap!!! Oh my!!! We received an award!! 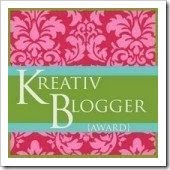 Darlene Pringle from "A Dancing Mango" has honored the Etsy Cottage Style blog with the Kreativ Blogger Award...Yeah!!! .We love everything and anything cottage style from fresh kitchens to enchanted gardens. .We like to try new things...recipes, techniques, mediums, ...the sky's the limit! .We enjoy "meeting" new people online, proving that you can always find something in common with someone else. .We are big on Family! http://www.kariandkijsa.blogspot.com ...Two sisters with impeccable taste! http://thechateauofremnants.blogspot.com ...Lots of beautiful pictures and inspiration here! 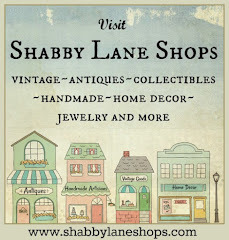 http://goinggreenboutique.blogspot.com she is a very active Etsy member, visit her blog for lots of creative tips!!! http://couturedepapier.blogspot.com ...Inspiring and beautiful artwork! http://www.forheartandhome.blogspot.com...If you like pink, sweet and roses, this is the blog for you! http://foofooelm.blogspot.com...Debi is a brand new member of our group and her jewelry is worth a trip to her blog. I hope you Ladies will grab a cup of coffee, relax and visit each one of these creative women and their fantastic blogs. Introduce yourself, leave a comment, let them know how you've been inspired by their work, I know they will love that! Thank you Darlene once again!! Have a glittery weekend full of endless inspiration! Thank you, Thank you!! we are so excited and honored to receive such a wonderful award!! You are so worthy of such a fun and kreative award and we are so glad you passed it on!! What a great list...we see a few new ones we are excited about visiting!! Congratulations on the blog award. I am trying to catch up on my Blog visits tonight so I am going to visit all these ladies! OMG! I had no idea anyone was visiting! Quick let me straighten out the living room and put the dirty dishes in the oven!..ok..I am so honored,I feel like a dysfunctional blogger most of the time.!! YAY for Etsy Cottage Style and YAY for all these talented artists who received this award! Oh I just want to say thank you!! That is a big honor coming from you! I love your blog and always enjoy my visits here!